Happy New Year team mates! 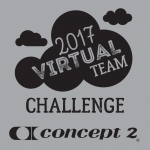 Well done if you are one of the members who have already uploaded metres on day one of the Virtual Team Challenge. 25 ETT'ers have signed up and we have started the year in 22nd place out of 44 world-wide teams. Hopefully we will have a few more metres on the board by the end of the day. Let's make this an awesome team challenge and beat our Fall Team Challenge 2015 result! Looks like a good start on day number one!